Yesterday I linked to an address by David Dockery on the state of evangelicalism in the 21st century. an evangelical is someone who likes Billy Graham; a liberal is someone who thinks Billy Graham is a fundamentalist; and a fundamentalist is someone who thinks Billy Graham is apostate. These are basically aphorisms, of course, and can’t be used as airtight definitions. Marsden’s first one is not entirely fair (though it points to something all-too-often true), but his second one gets at an important factor: how conservative Protestants viewed Billy Graham was usually a pretty good indicator of how they saw themselves and interpreted the virtues and vices of others in the church, especially after Graham’s 1957 crusade in Madison Square Garden, in which fundamentalists were dismayed at his partnership with modernists. In my opinion, the two best introductions to fundamentalism—indispensable treatments, really—are George Marsden’s Fundamentalism and American Culture (though I disagree with some of his analysis on the Princetonians and inerrancy) and Joel Carpenter’s Revive Us Again: the Reawakening of American Fundamentalism. Marsden focuses upon 1870-1925 and Carpenter focuses upon 1925-1950. 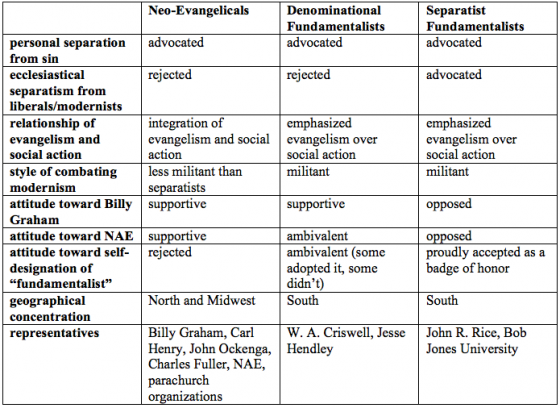 Finn shows that one common mistake in analyzing fundamentalism and evangelicalism is the assumption that they are simple, monolithic categories. In reality, there are subcultures within both, containing different visions and suspicions, even if united in some significant ways. Fundamentalism is a fascinating subject of study, still under-explored when it comes to its relationship to evangelicalism. But hopefully the introductory analysis above helps us begin to avoid the reflex to assume we are only talking about one unitary thing when we employ these labels.